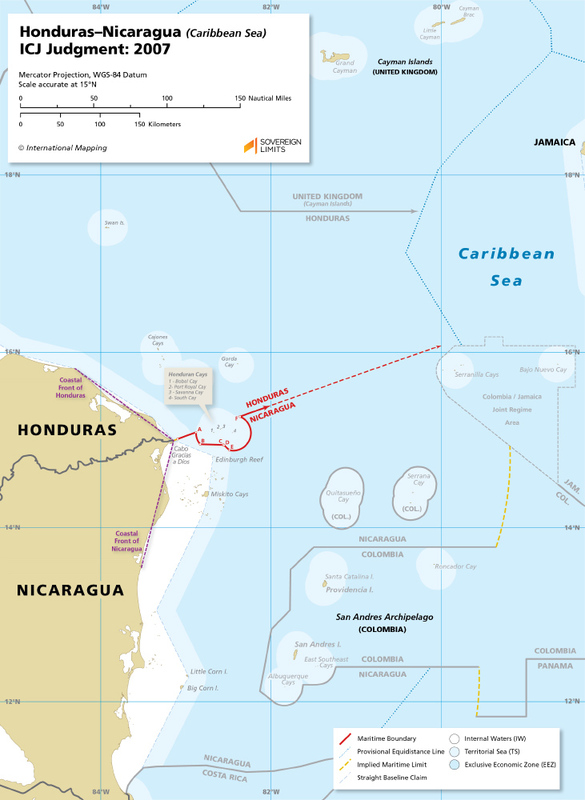 The maritime boundary between Honduras and Nicaragua in the Caribbean Sea was established by a Judgment handed down from the International Court of Justice in 2007. Due to the unstable coastline near the mouth of the Río Coco, the Court elected to start the boundary 3 M offshore. For the most part, the boundary is a bisector line that advances seaward on a directional bearing from true north of 70° 14′ 41.25″. 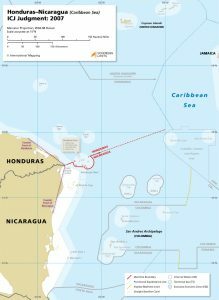 Its course however, was altered near-shore to protect the territorial sea entitlements of four tiny Honduran islets located near Cabo Gracias a Dios. In addition to the Court’s use of the bisector methodology, it also employed 12 M enclaves and a brief section of equidistance lines to semi-enclave the Honduran islets.